Fashion is one endless cycle. Constantly regurgitating the trends and naming it THE DECADE OF ____ and then debunking it as a Multi-decade Mashup is kind of screwed up. Fashion is in a quandary. Never before have we been able to wear 60’s grunge, 70’s funk, and 80’s ostentation all at the same time. Like a blazer worn with a glitter skirt over pants. I was lucky enough to listen to a Trend Forecast Presentation presented by David Wolfe of the Donegar Group who delightedly spoke about color and trends by turning them on our heads and simplifying the makings of fashion into reality. I too am guilty of succumbing to this potpourri trend as well. In this post I am wearing a grungy black turtleneck, a shredded black long See By Chloé sweater and skinny J.Brand Galaxy splattered purplish jeans and a vintage Moncler jacket. The Isabel Marant scarf just adds to the hippie vibe. I looked like I was wearing shmattes but it some crazy sense, it works. 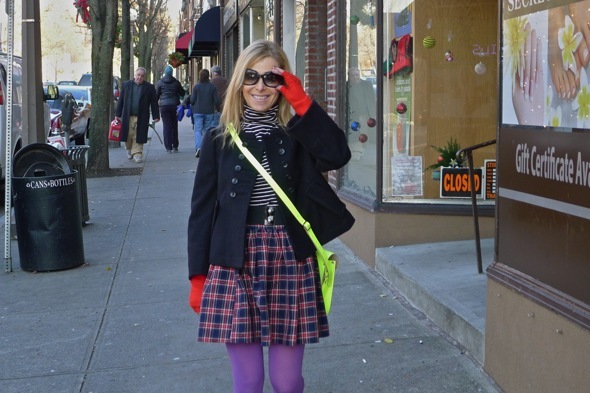 And here I am guilty of 1980’s school-girl flavor where stripes marry plaids with just a touch of neon. Here are perfect examples below on the Spring runways. Dolce and Gabbana showed a ultra- feminine fruity bra and pencil skirt with a floral celery-hued 3-D lace coat, and a structured bag. A modern-beauty with boundless sensuality based loosely on Sophia Loren in the 1950’s during an Italian summer. 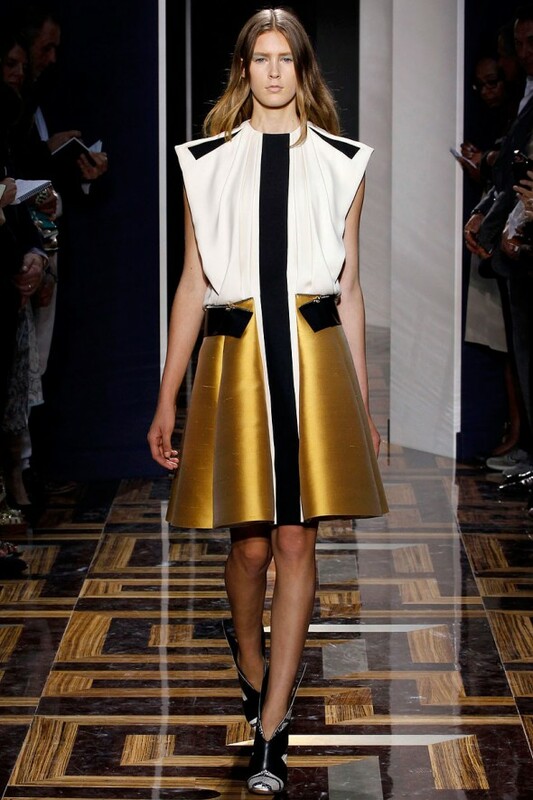 Contrasted with Balenciaga’s boxy volumes of geometric pieces of stiff 1960’s fabric spun into luxurious scuba textiles for his Spring show. The graphic black and white dress paired with chartreuse cold combos makes this cartoon ready for space launch into another galaxy. Ultimately, it is companies like Uniqlo using heat-retentive garments, and artists like Husein Chalayan and Gareth Pugh that are our fashion inspirations by using technological advancements in science that will be influence the tech-savvy styles of tomorrow. This isn’t brain surgery folks, we are blinded by science and it is symptomatic of our FEAR of the future. We don’t have a present. The past + future = present. As Tom Ford says, Fashion needs to change when life changes.” We are ready to propel fashion forward and minimize referencing the past. Science and fashion is the engine that will move us forward. But we are not there yet. But will we be wearing this on the streets someday? Your bet is as good as mine. Not so sure, but we might be wearing tents so we won’t have to get dressed in the morning we will be ready for anything at the push of a button. I love all the combinations of period pieces… it works for me. Not sure about the wired thing!! Maybe with lights?? i love every single piece, want. great print shirt with the leather pants..omg gorgeous.